That the Cavs won Game 3, at home, on another act of eye-popping heroism from LeBron James, should surprise exactly no one. The Cavs were the favorites, they won both games in Toronto, they have the best player in the world, and the Raptors are cursed. But that doesn’t mean the game wasn’t without genuine surprises, like, oh, say, whatever the hell happened to DeMar DeRozan. DeRozan struggled to score in Game 3. 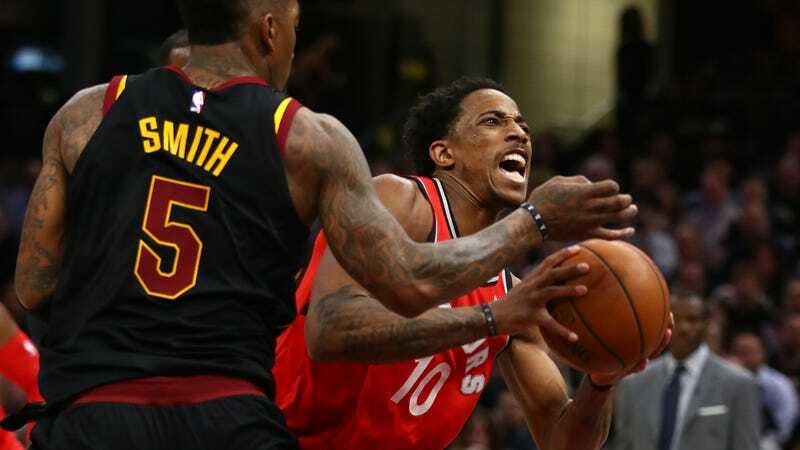 The Cavs sent traps and extra defenders his way, and emphasized getting the ball out of his hands, and DeRozan, Toronto’s most talented and versatile offensive player, and who has led the Raptors in scoring through these playoffs, did not respond particularly well. Through DeRozan’s first 28 minutes of action, he attempted just 12 shots, made just three, and only got to the line twice. He was a dismal minus-23 in those minutes, and when Dwane Casey took him out of the game, with just over two minutes left in the third quarter, the Raptors were down 16 points in an absolute must-win road game. It turned out that those 28 minutes were all DeRozan would get. The Raptors chipped away at Cleveland’s lead over the next four and a half minutes with sub-heavy lineups featuring Delon Wright, C.J. Miles, and OG Anunoby on the wing, and had it down to nine points with just under 10 minutes left in the fourth quarter. This might’ve been a good time to reinsert DeRozan, who, previous struggles notwithstanding, is for sure one of Toronto’s two best players. The Raptors continued chipping away over the following five minutes, and had Cleveland’s lead down to four points with just under five minutes left on the clock. Here, too, would’ve been a fine time to bring DeRozan back, but Casey held pat. I don’t even know what it means for anyone on this Raptors team to “bounce back” after this. They can’t realistically any longer consider themselves legitimate contenders in the East; this crushingly disappointing playoff exit might mean wholesale organizational changes this offseason; no one anywhere would so much as blink if it winds up costing Casey his job. With so much at stake, the Raptors chose to play out the defining moments of their season with their All Star leading scorer exiled to the bench. One way or another, that has to say something about the potential and structural integrity of these Raptors. Yes, the Raptors had an incredible bench this season; on the other hand, I can’t think of another team in recent NBA history that would’ve deliberately faced these odds with such an important weapon left on the shelf. If DeRozan isn’t a guy you have to have on the floor in that situation, just what is he? The Raptors were for sure in a desperate situation. Casey made the choice to ride the hot hand, and it nearly worked, but the sight of the Raptors playing out the final meaningful minutes of their season without DeRozan on the floor was genuinely jarring. It was a final indignity for a team that engineered the best regular season in franchise history and then watched it get crumpled up dismissively by the same old nemesis. How could anyone bounce back.